My name is Christian, and I'm brand new to this forum. 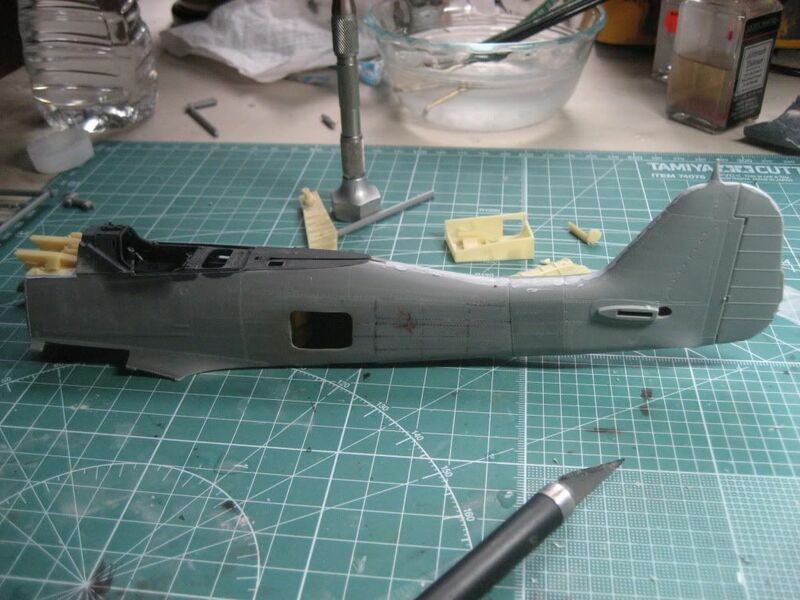 I am a 23 year old American who has been building model airplanes since the age of about 9. I live on Long Island; very close to the old Republic P-47 plant (now Republic Airport, along with the American Airpower Museum). 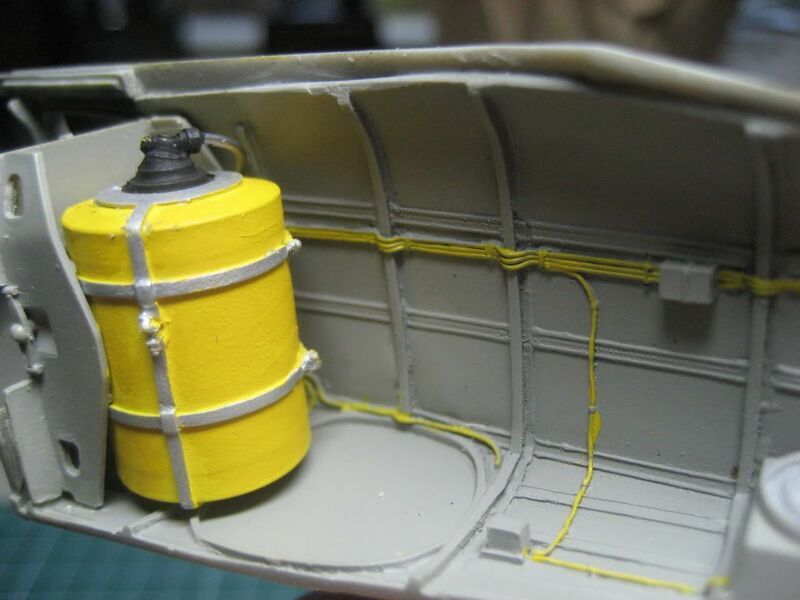 I am a huge fan of the bubbletop P-47D even though I have never built one. (Don't worry, it's on my list.) 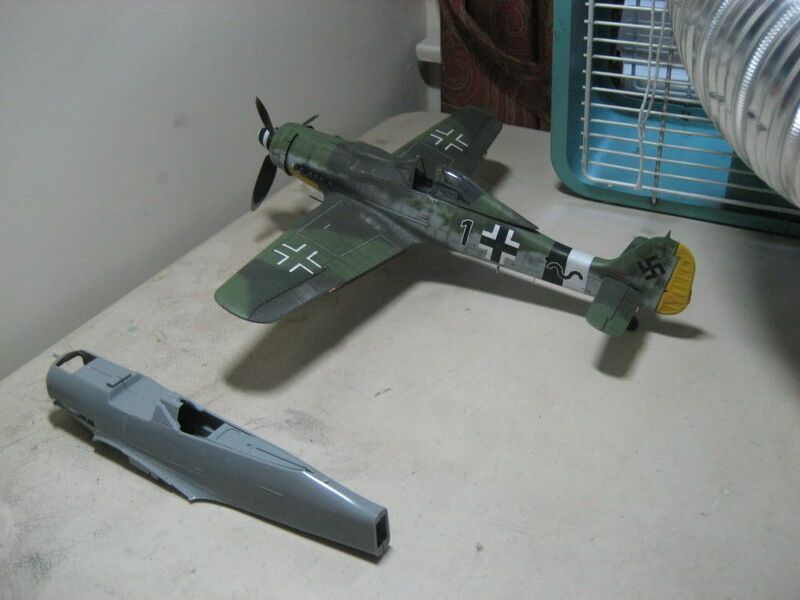 Luftwaffe aircraft are my favorite. For years now, I have been admiring all of your work on Hyperscale, the ARC, and here on LSP. I decided it's high time I shared some of my own work with you! In 2008, I began constructing "Blue 12," but was forced to set the project aside until now. I only worked on it a little bit in 2010 since then. This kit represents a massive undertaking for me as a modeller due to the amount of AM, research and extra work I am putting into the kit. 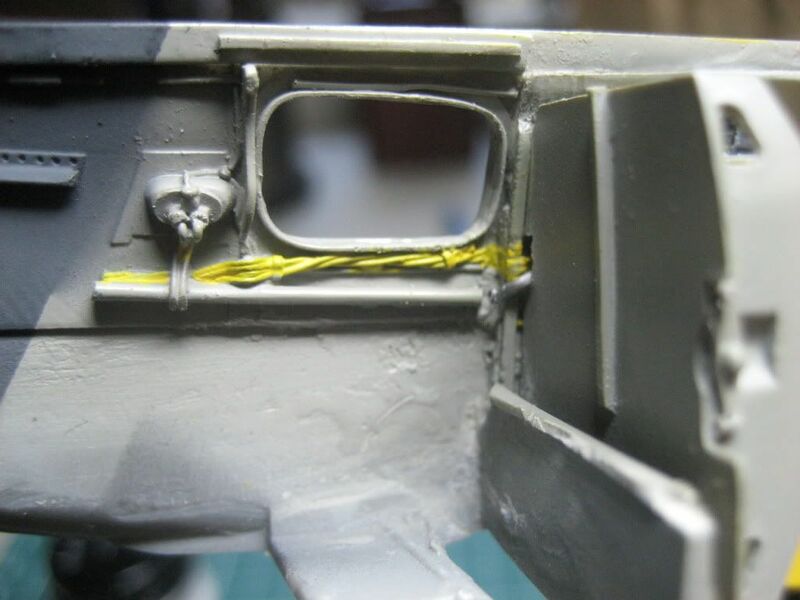 Before this project, I completed Dortenmann's colorful D-9 using the old Hasegawa "high grade" kit, which features raised rivets on the wings and incorrect MG 151/20 bulges. Before that, I completed Hartmann's "White 1," which I consider my best work to date. (I will post pictures of this in the appropriate thread soon.) 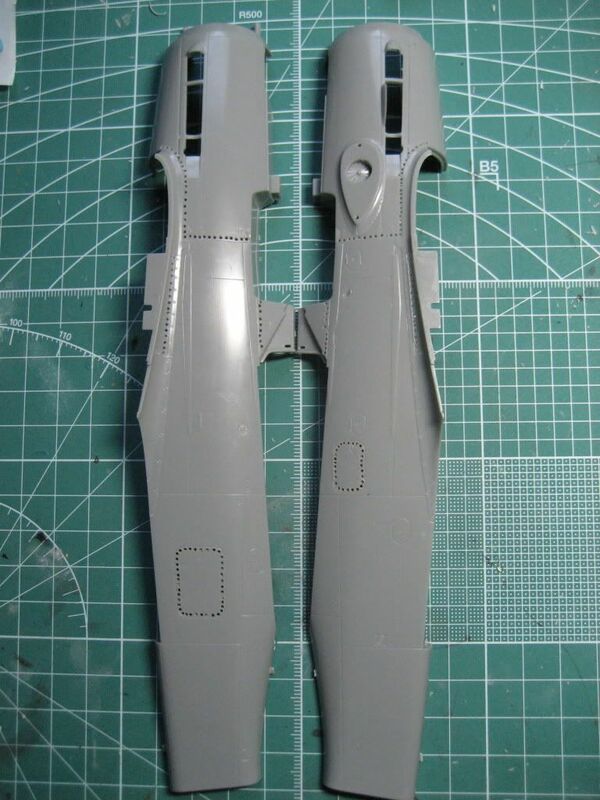 I am seeking to use JaPo's latest book, "Focke-Wulf FW-190D Camouflage & Markings - Part II" to create the most realistic rendition of "Blue 12" as possible. 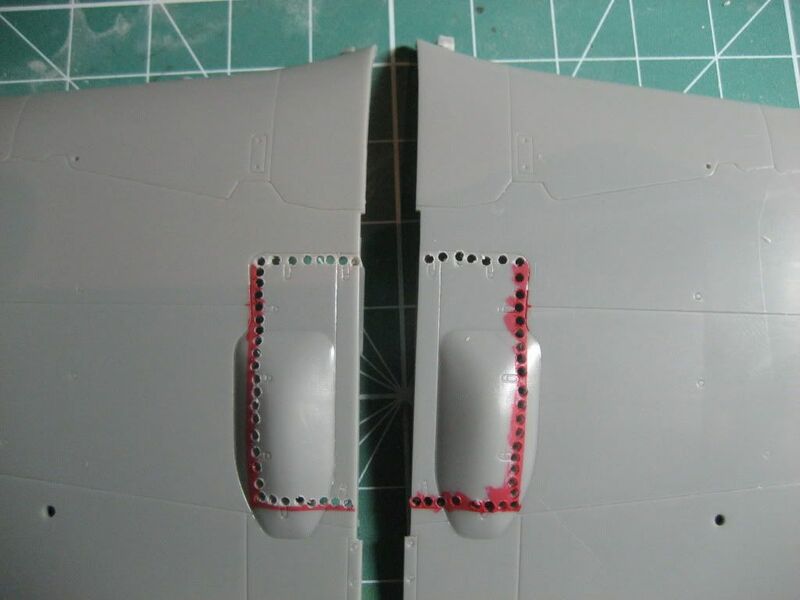 A lot of disagreement exists concerning the correct paint scheme for a such a well-documented aircraft. My understanding is the JaPo book lays any uncertainty to rest. My goal is to make a diorama with American soldiers and the pilot who surrendered. (Will be tough as I can't find 1/32 soldiers anywhere.) I want to simultaneously depict the surrender of Nazi Germany and the American fascination with captured German technology. This, in a way, is the classic AM 190 - any and all AM to create the most opened-up, super-detailed monster possible. In another way, it's a little different. 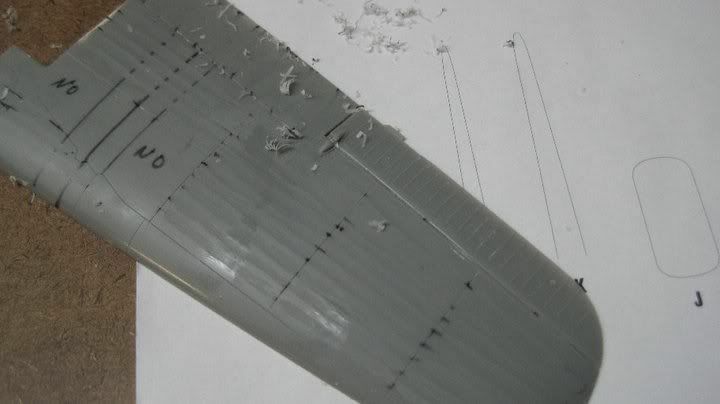 I have noticed that super AM 190D builds tend to destroy the clean lines of the aircraft. They make use of the incorrect, voluptuous gun cowl, displayed open. This is nice for displaying the upper section and the machine guns. 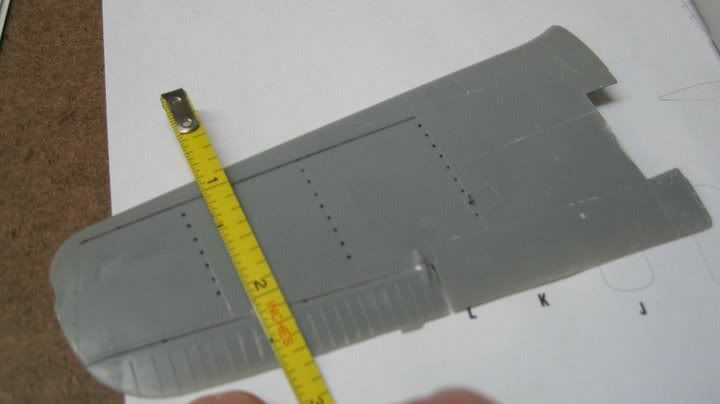 My goal instead is to use the Eagle Parts replacement gun cowl, along with the rest of the Aires AM engine parts to depict a Dora with not only an accurately shaped gun cowl, but clean lines. 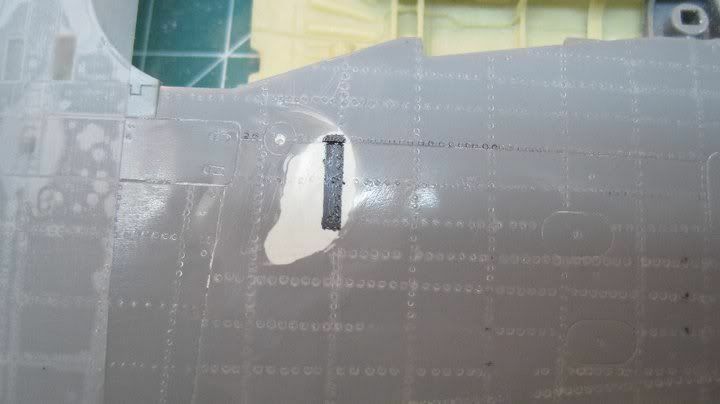 I am also riveting the entire airplane using the MDC rivet tool. 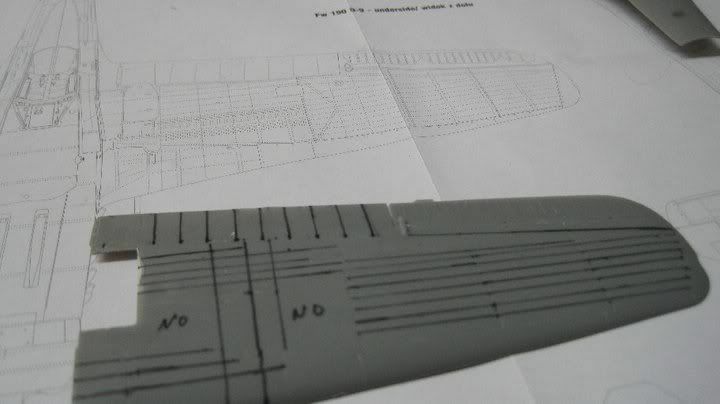 I acquired blueprints of the plane that will make this process accurate and easy. 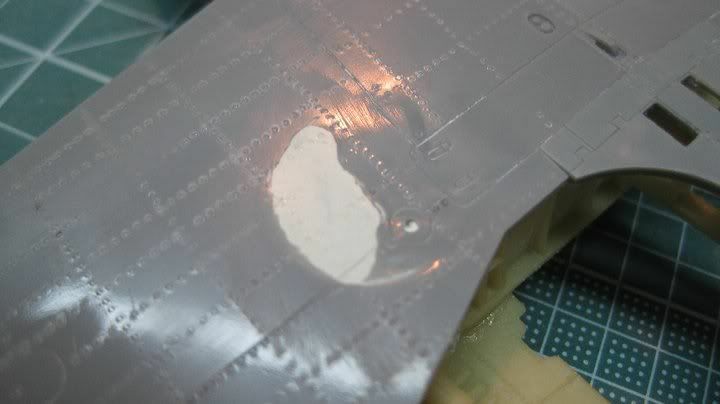 This project also represents my first go at the stressed skin effect, which I am modifying by using an MDC rivet tool instead of using a pounce wheel. 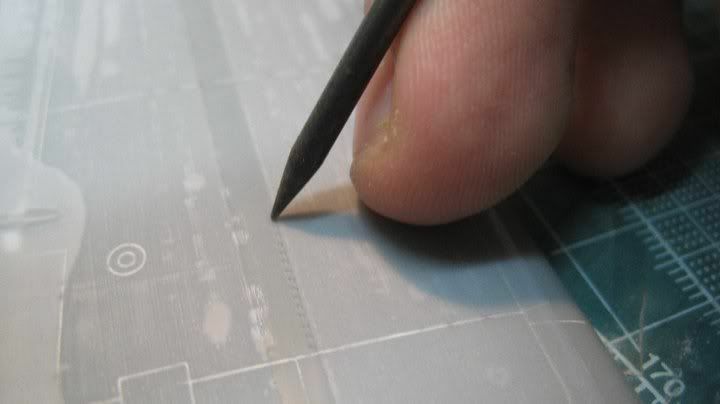 I believe the MDC tool produces a much more realistic effect that is worth the extra pain involved. 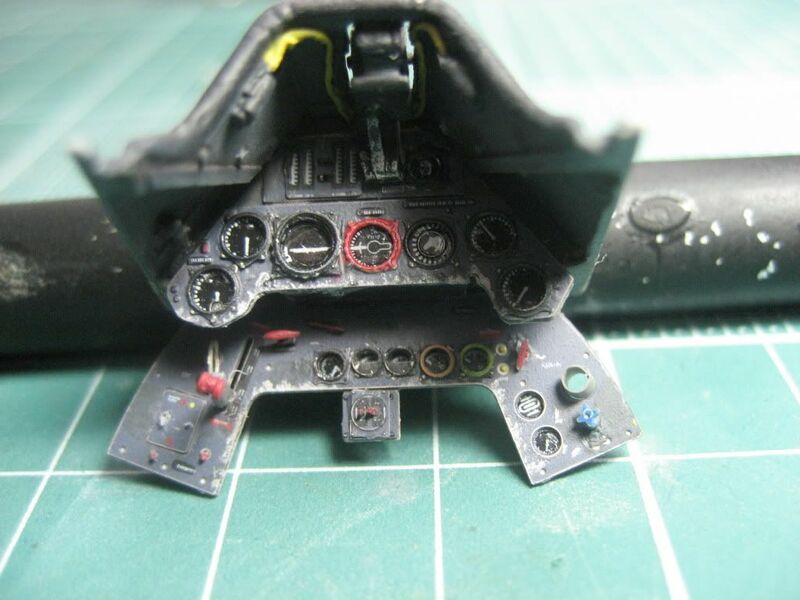 I have acquired a Fw 190D manual which shows how most of the Jumo 213 engine is plumbed and wired, but some ambiguity still remains. pictures to come. I suppose I have to upload them elsewhere on the web before I can attach them here? 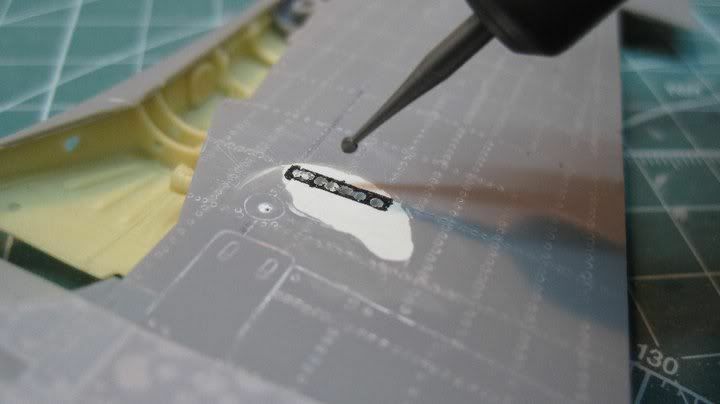 I'm building the Hasegawa High Grade kit myself at the moment, though I'm converting it to a D-11. 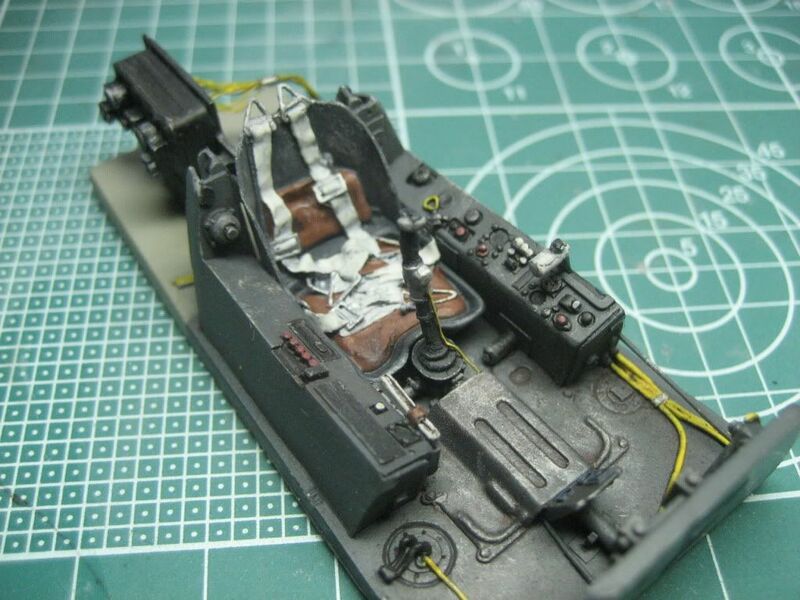 I also built Dortenmann's aircraft using the ancient Revell kit some years ago. Looking forward to seeing your build! That's correct; just use Photobucket or similar, and link your photos from there. There's a tutorial about it in General Discussion too. Sounds great. Looking forward to seeing your work Christian. Airfix made/make a series of 1/32 soldiers, they were called 'multipose' and came as sets of about 8/pack. Seperate arms, legs, torso, head (I think) and then an array of equipment to add. I think they are quite well regarded. They do a set of US Army, Europe, so should be just what you're after. 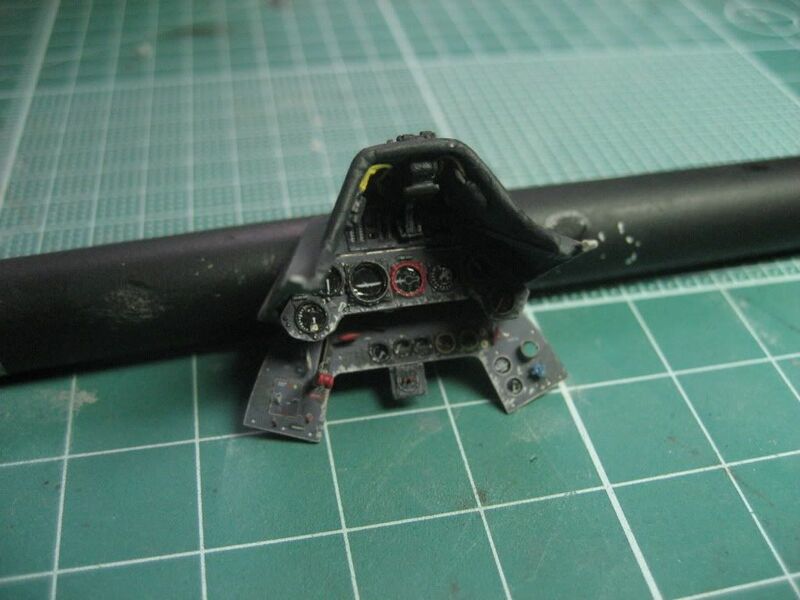 Type 'Airfix Multipose' into Google and you'll get plenty of hits. Should be good mate. 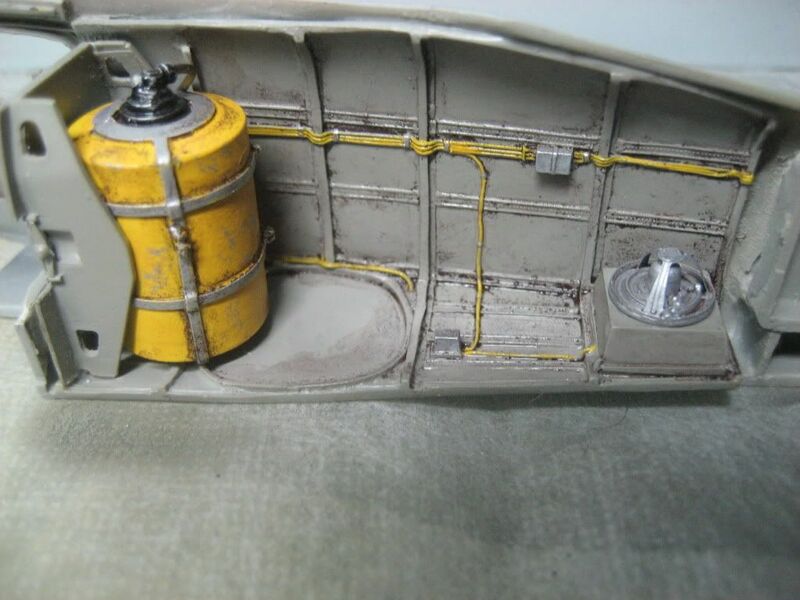 Just a note though, if you wish to depict the aircraft as it was when captured, it carried no drop tank. I got some more pics if you want me to scan them for you. Thanks for the welcomes guys! BradG: Yes, you are absolutely correct. I bought the drop tank early in the build when I was still uncertain I would finish my D-9 as "Blue 12." Any and all pictures would be very much appreciated, as I still have not purchased the JaPo book yet! Please note that I have seen the pictures that come with the EagleCals. If you have others, then I have never seen them before, and that is very exciting! All in all, thanks for your warm welcomes guys. Look forward to hearing from you all as I finish this daunting project! Sounds like quite a project, can't wait to see some pics! LSP_Kevin: How are you going about the D-11 conversion? All the gory details are in the build thread I linked to. Which reminds me, I must get back to it soon! 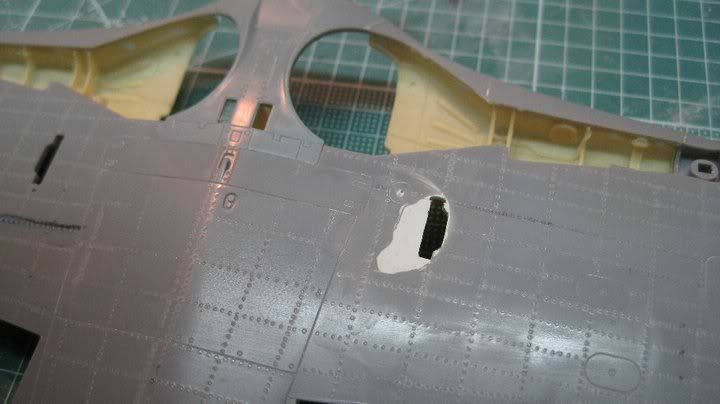 Great job on Dortenmann's aircraft by the way. Yes, I was thinking they'd make a good basis for converting - especially as the arms and legs are seperate. Ok, test photo worked, here are more! These are all from 2008. I will let you know the approximate age of each batch of photos as I upload them. 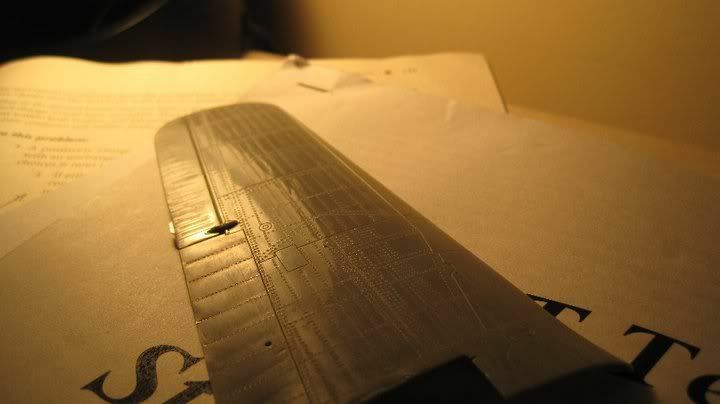 In addition to this work, I built the Eduard flaps and riveted half of the lower wing. 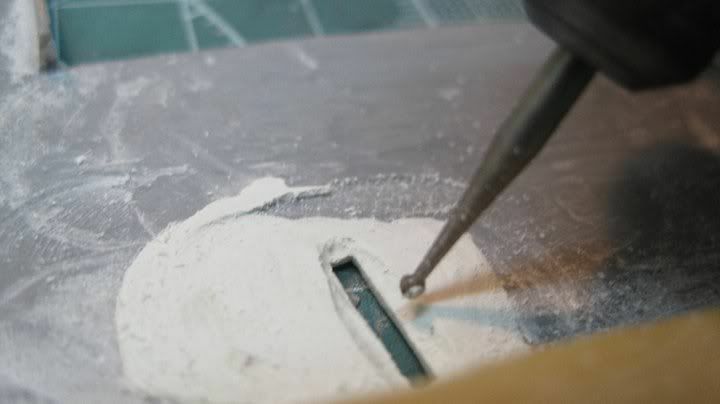 I then let the project sit until October of 2010.
just finished puttying and sanding the hole. I didn't take a picture of the immediate damage. 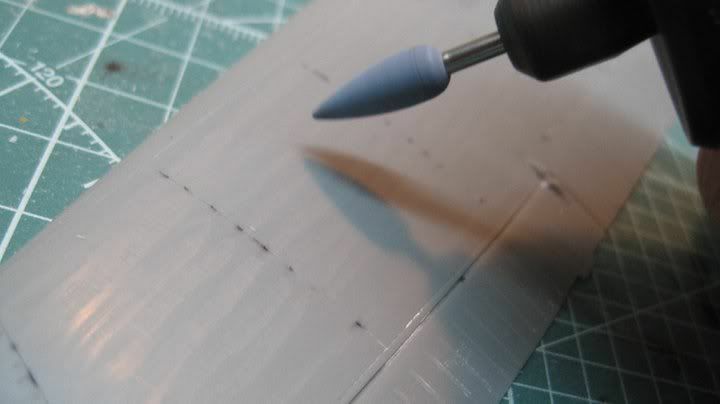 You can see the outline of the dremel attachment where the plastic shows strain. phew! not perfect but I'm glad I was able to save the wing from the scrap heap. 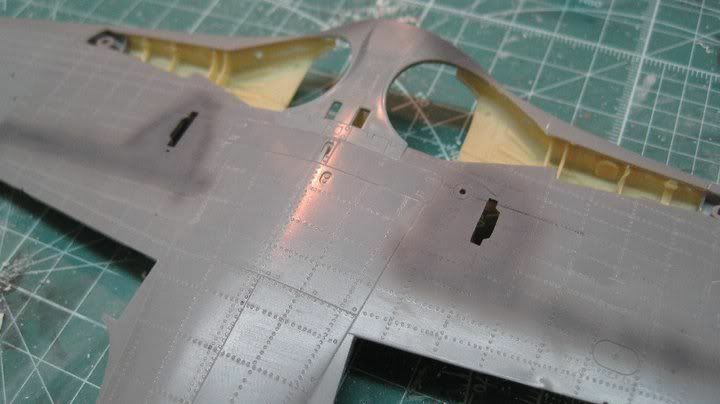 I have since corrected the rivets shown in these pictures as some are totally fanciful. 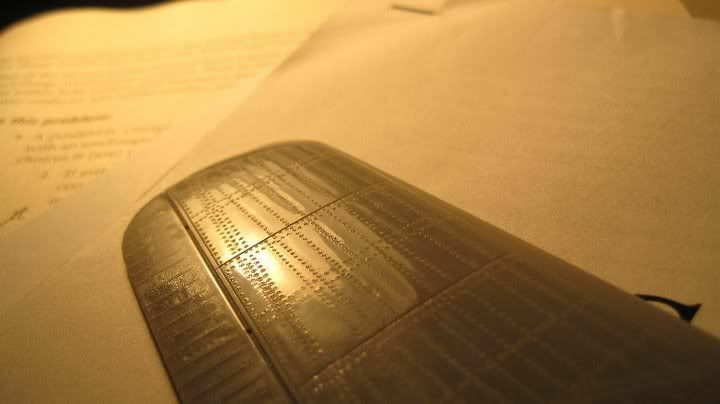 October 2010: Stressed Skin Effect. Boom! My first time at this. I was pretty satisfied with my work, but I must admit I wasn't able to do this job without there being a few micro scratches here and there. 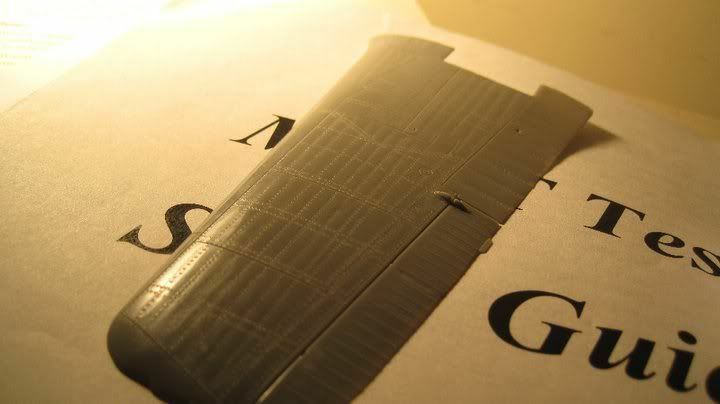 Two remedies for next time: use a more rigid blade. 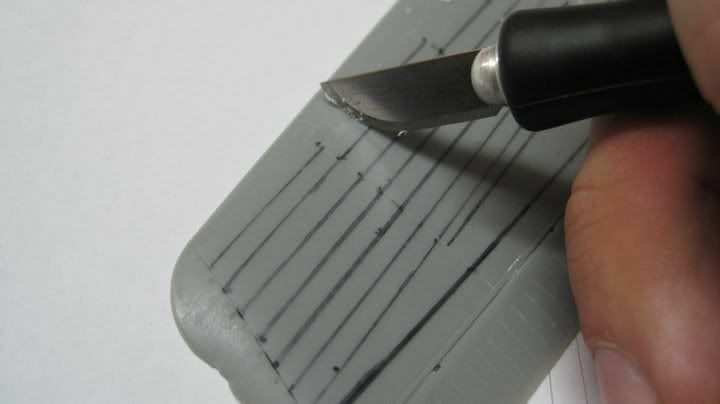 Blade flex while drawing the scalpel across the plastic creates repeating line patterns perpendicular to the motion of the blade. 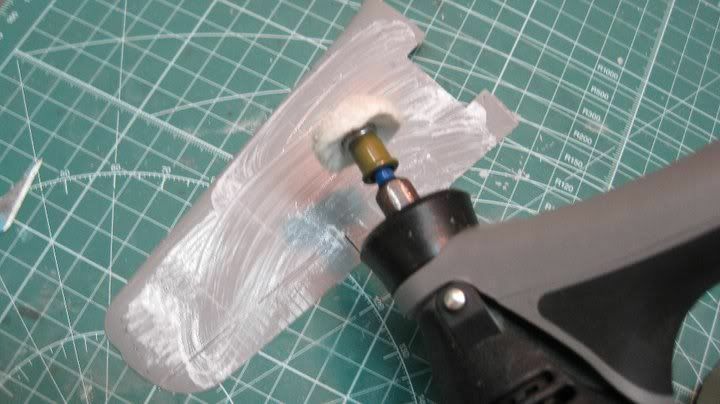 The second remedy: use an extremely sharp, brand-new blade. 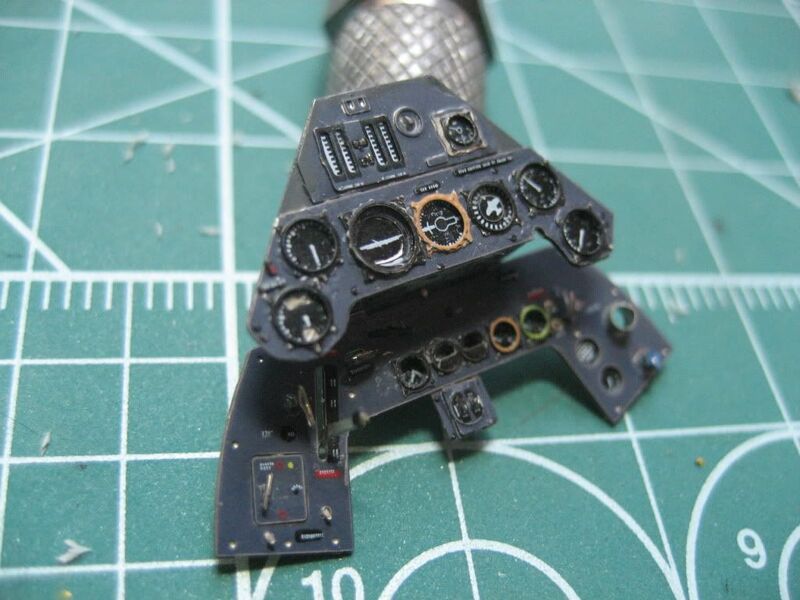 I want to stress Hasegawa's P-47D in NMF, so I'll need to have mastered this technique to produce a convincing result. The two remedies I've got in mind should be a good start.